This article debunks a number of myths about invoice finance for recruiters. We identified these misconceptions during a piece of research into sources of funding for local recruitment companies. It found that there were 25% of recruitment companies that had considered sales financing but hadn't gone ahead due to a number of misconceptions. 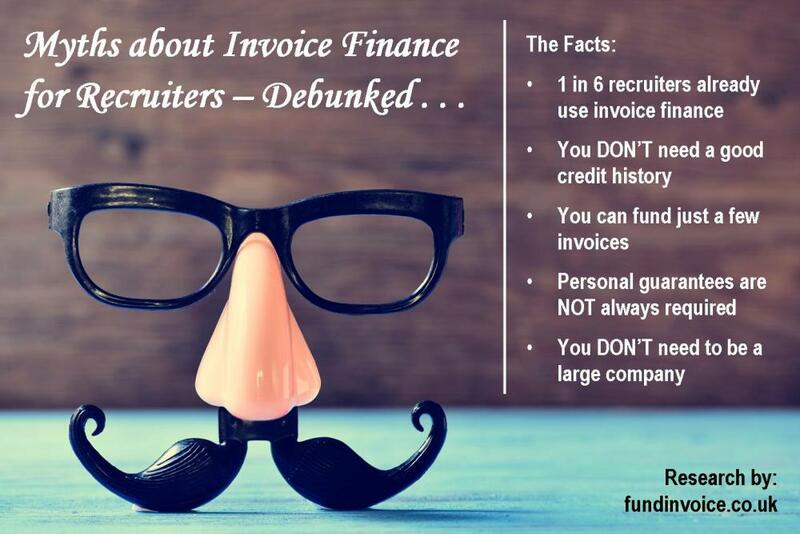 <a href="https://www.fundinvoice.co.uk/recruitment/myths-about-invoice-finance-for-recruiters-debunked.html" ><img src="https://www.fundinvoice.co.uk/images/infographic-myths-about-invoice-finance-for-recruiters.jpg" alt="Myths About Invoice Finance For Recruiters Debunked" width="450" /></a><br /><a href="https://www.fundinvoice.co.uk/recruitment/myths-about-invoice-finance-for-recruiters-debunked.html" >Myths About Invoice Finance For Recruiters Debunked</a> by <a href="https://www.fundinvoice.co.uk/" >FundInvoice Research</a>. <a href="https://www.fundinvoice.co.uk/recruitment/myths-about-invoice-finance-for-recruiters-debunked.html" ><img src="https://www.fundinvoice.co.uk/images/infographic-myths-about-invoice-finance-for-recruiters.jpg" alt=" Myths About Invoice Finance For Recruiters Debunked" width="1000" /></a><br /><a href="https://www.fundinvoice.co.uk/recruitment/myths-about-invoice-finance-for-recruiters-debunked.html" >Myths About Invoice Finance For Recruiters Debunked</a> by <a href="https://www.fundinvoice.co.uk/" >FundInvoice Research</a>. Wrong. Our research found that a high proportion of recruitment agencies actually use invoice finance already - some 20 times the national average amongst businesses generally (according to our estimates). We found that just over 1 in 6 recruiters were using some form of finance against their sales invoices (17% of our sample). Wrong again, you can. The beauty of IF is that eligibility is based on the strength of your sales debts, not your business. Financiers will overlook your poor credit history if you have simple, straightforward credit invoices, being raised to reasonable quality customers. The staff placement sector tends to produce particularly good quality receivables, as the underlying transaction is simple and often evidenced by a clear audit trail e.g. signed timesheets, in the case of temporary recruitment. This is why staff agencies are a core sector handled by IF companies. It doesn't have to be. Prices start from a single fee of £3,000 + VAT per annum to fund against all your invoices, or you could just select invoices that you want funded and pay just for those, without any obligation to fund more invoices. Also, we have been able to find businesses cost savings on prices quoted by others. On average we have been able to save c. 34% of the fees for clients. It is therefore highly likely that we will be able to find you a cost saving if you are already using a service provider. Not necessarily. Personal guarantees are often requested by IF companies. However, in many circumstances they will limit the value of them, and in some cases they will accept just a fraud warranty (an undertaking that you will only be liable if you comit a fraud). We came across several businesses that said they were going to use it once they were bigger. There is no minimum size criterion to use IF. On the basis that there are providers that will allow you to raise finance against invoices valued at just a few thousand pounds, there really isn't a limit on a size that you need to reach to use it. The key benefit of this type of funding is that it will enable your growth. 87% of existing users told us it had enabled their growth. Hopefully that has answered some of the misconceptions that we have come across. If you would like any further help finding a suitable service provider please contact us or call Sean on 03330 113622.